Healthy Fruit Juice : Is it the Perfect Answer ? Is fruit juice the healthy answer? Breakfast is generally considered as the most important meal of the day. At breakfast time, most of us put some calories in our body and we are preparing to start the most active part of our day. But the always-famous combination of breakfast cereals with fruit juice and toast has now become a taboo with the nutritional inventions. With the ‘low-carb, low-glycemic index’ food choices, cereals as wheat flakes are preferred over cornflakes, white bread is substituted by whole wheat bread with low-cal butter, and fruit juices by whole fruits. So what happens to our all-time favourite breakfast? Well, it may just have to get little healthy. The logical answer for the consumption of a couple of glasses of fruit juice is that fruits are healthy, therefore fruit juices are healthy. But the logic doesn’t apply to nutrition. Even with no sugar added, zero preservatives, unstrained fruit juice would have the same amount of sugar as a cola beverage, because fruit is full of sugar! The sugar is from fructose that’s naturally present in fruit; if it’s ’10 per cent juice’, most of the sugar is in the form of high-fructose corn syrup. When a fruit juice is ‘without added sugar’, it means sucrose or table sugar is not added. But the sugar of the fruit obviously remains. Sugar in 340 ml of fruit juice (no added sugar) is equivalent to calories in 340 ml (one can) of Coca-Cola. All the above basically tells us that no matter which juice you choose, they all have more calories than the same amount of Coke. It tells us that juice – 100 per cent juice, no sugar added – contains about the same amount of sugar (or even more – 50 per cent more for grape juice) as the same volume of Coke. 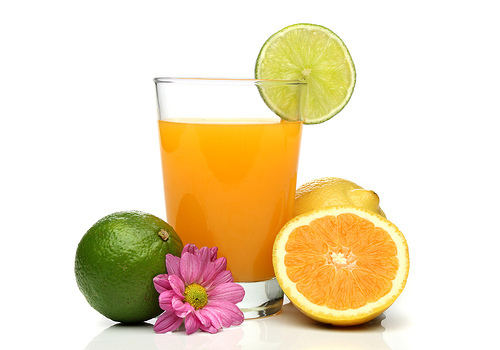 It tells us that, freshly-squeezed fruit juice without straining, is no different in calories (would be slightly higher in fibre). All that is healthy is not low-calorie. 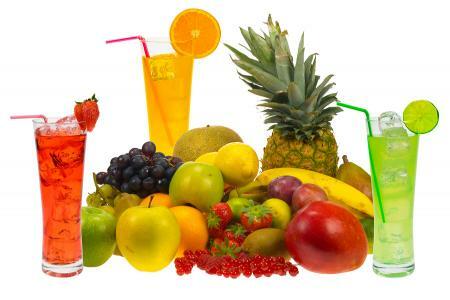 Fruit juices are caloric dense, also they are restricted for medical conditions like diabetes. A glass of juice a day is not complete nutrition. Also, its introduction in your diet should be well understood. If an individual is aiming at fat loss, fruit juice is definitely not the answer. Substitution of fruit juice with a whole fruit has lot more benefits. It’s good to be health-conscious, but with the right advice. Half knowledge is worst than no knowledge. Accurate ! Add to it, dont drink fruit based milkshakes (fruit + milk is not advisable ) !